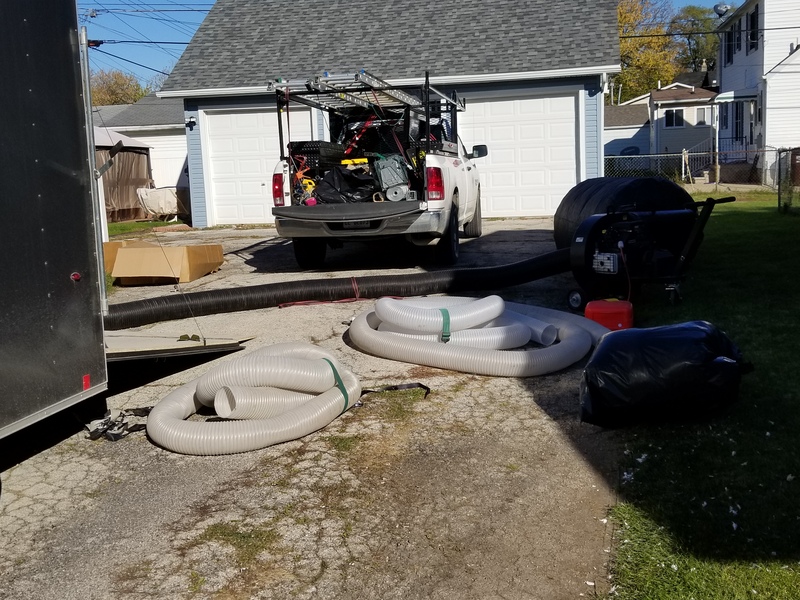 Vacuuming out droppings and removing any contaminated insulation from the attic with a 20 horse power insulation vac or with 7 mil plastic construction bags. Latex based Killz or mold treatment to remove any odors and lock them out of soiled wood and drywall to prevent further staining. Replacing insulation with new cellulose or fiberglass insulation. Installed to a proper R Value. Typically R-49 is sufficient in most homes. The problem we deal with the most is nuisance wildlife in the attic space. Exclusion, trapping, and animal capture is only the first part of the job. Sometimes the most import part to someones health or structure is removing the contaminated insulation. Most animals like bats, raccoon's, birds, mice, rats, and squirrels use your attic as a toilet and leave all kinds of animal waste. Most animals including birds will leave behind parasites like fleas or mites. Raccoon feces contains eggs of the roundworm. The waste in your attic will make your attic smell bad, can be a health risk, and also attract new animals into your attic. At Michigan Bat Control & Wildlife Solutions of Macomb County, MI we offer attic cleanup, deodorization, and decontamination services to eliminate contamination in your attic space. We make your attic a safer place by eliminating the odor, bacteria, fungi, and mites. At Michigan Bat Control & Wildlife Solutions. of Macomb County, MI we offer many attic clean up services. Sometimes your attic may not be damaged enough to have all of the insulation removed. Often times a simple spot clean can be done at a significantly reduced rate which may be just as effective. If your attic is damaged bad enough and you need insulation replaced you may want to contact your homeowners insurance company as a lot of the time they will cover this service. We work with several insurance companies in Macomb County, so we can help you to get your attic cleaned and restored. Having animal waste in your attic is not healthy, structurally unstable and should be removed from your attic completely. Raccoon droppings, bat guano, bird nest, and rodent dropping can all cause many diseases and should not be taking lightly. Damaged insulation will not insulate your attic properly and will not ventilate the way it should. If you live within Macomb County, MI or any surrounding areas we service your area. Contact us today for more information.